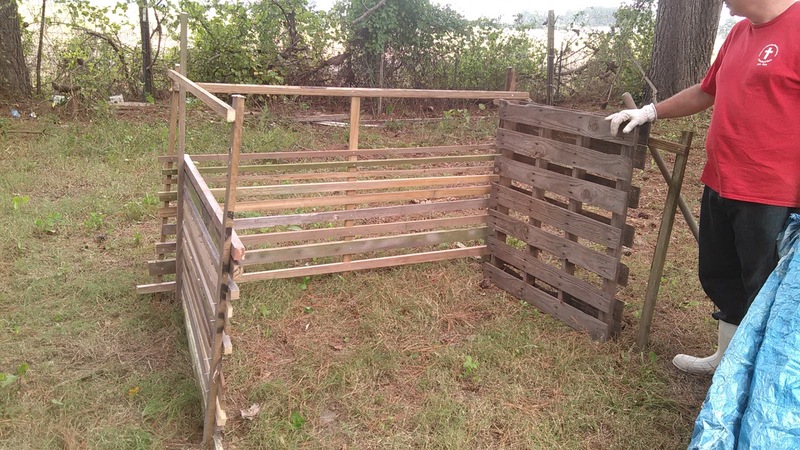 Now he has four compost bins all in a row. 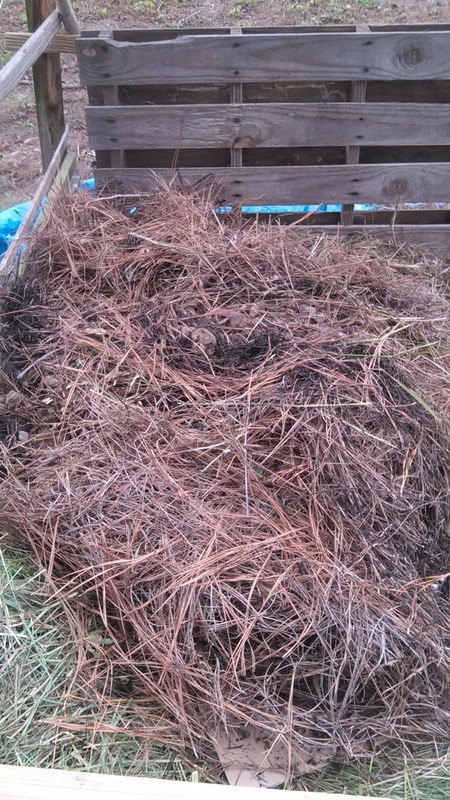 He's layering the grass and pine straw with goat manure right now, very dry, very old goat manure. In spite of the rain (of near-Biblical proportions) we've had in recent days, do you see how dry the inside of that manure pile is? 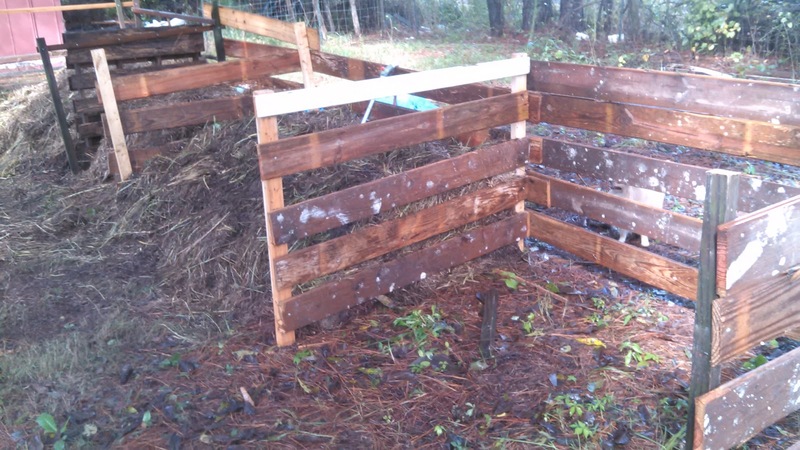 It's quite hard to encourage water into this compost. Adam hauled all the junk wood from where it was ripped out of the out-building, and used some of that semi-rotted flooring to make the compost bins. 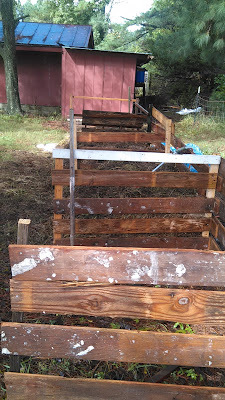 It's no good for flooring, but it's perfectly useful for holding up compost. He's decided against using the shower doors (phew!). There are limits to how "jakey we are willing to look. Jakey is a word my grandmother used. She had quite a few fun terms from her West Virginia upbringing. Adam found three long iron posts buried beneath pine straw along the back fence. They're about twelve feet long and heavy. 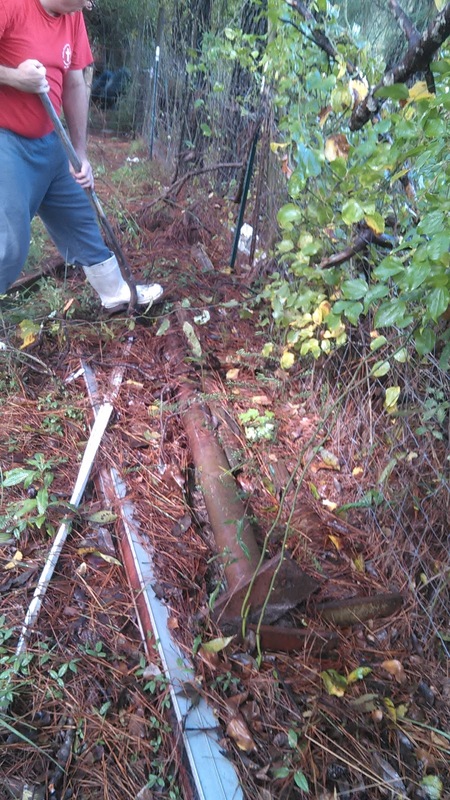 He dug out one of them to investigate. 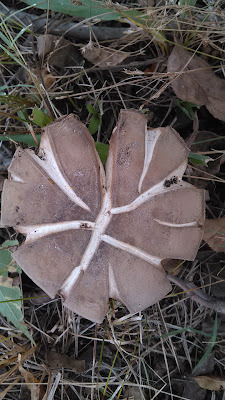 Anybody know what these are? Each one has a flange on each end. He's ruminating on what purpose he could use them for on the farm. I'm wondering what purpose they served before. Speaking of rain, we're so glad Adam raised the beds in the winter garden. The seedlings have truly sprouted! They haven't drowned yet. Do remember: a plan is a basis for change. Adam did a scale drawing of the farm using Google Maps as a base for the main structures and the boundaries. 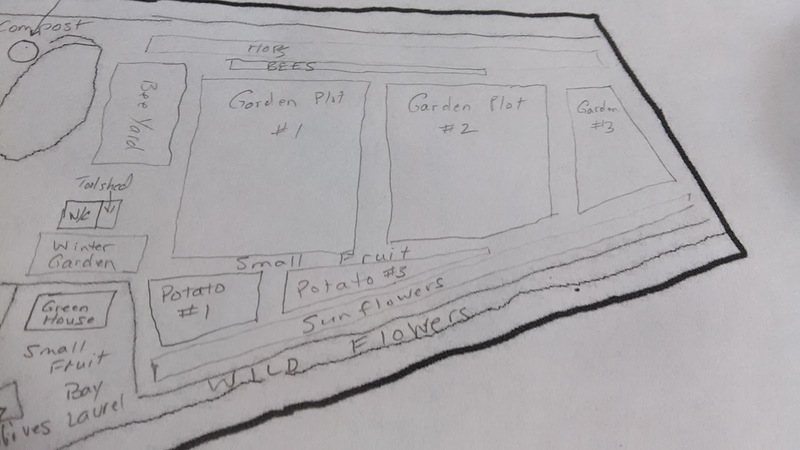 I thought you'd enjoy seeing what his plans are for the eventual plantings, the main plots. I hope perhaps you can read his writing. 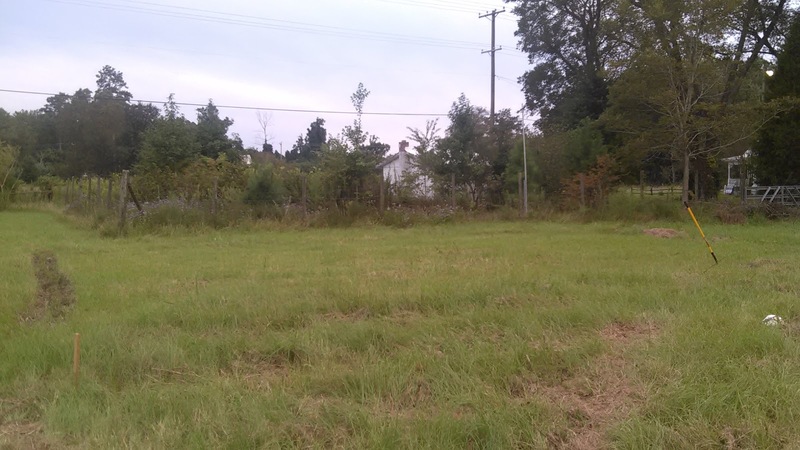 The house is the oddly-shaped object in the middle of the driveway loop. 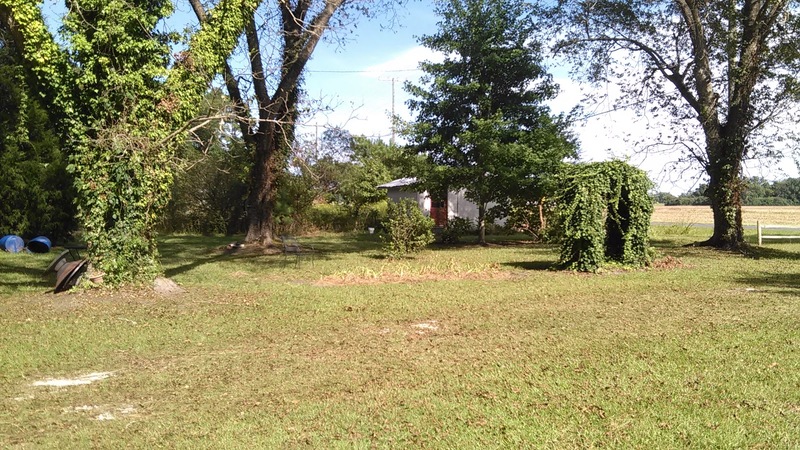 The square at the top of the loop is the carport. 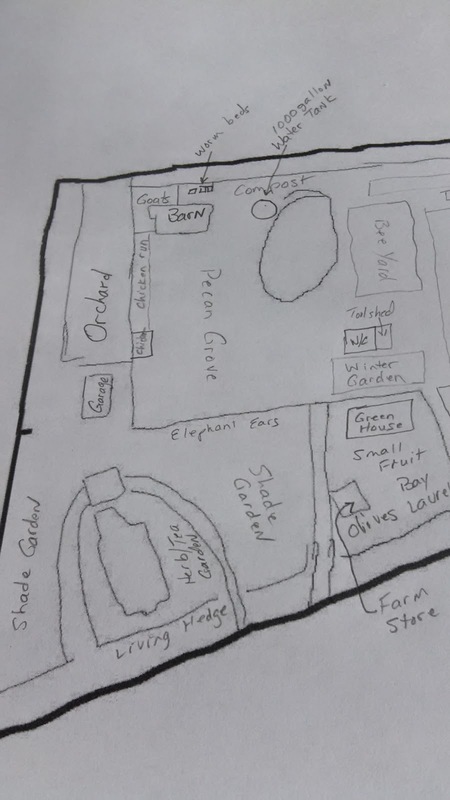 Above is the left side with the house and garage, orchard and barn. That big oval is the pine grove. 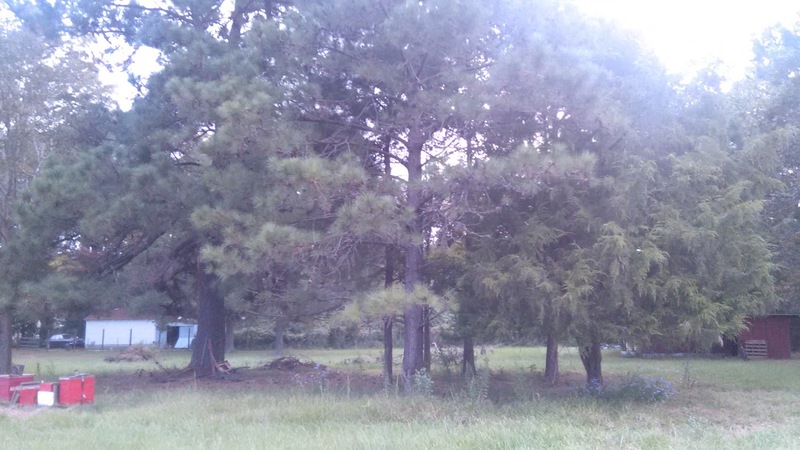 It has only two big pine trees and a few others, but we call it the pine grove nonetheless. 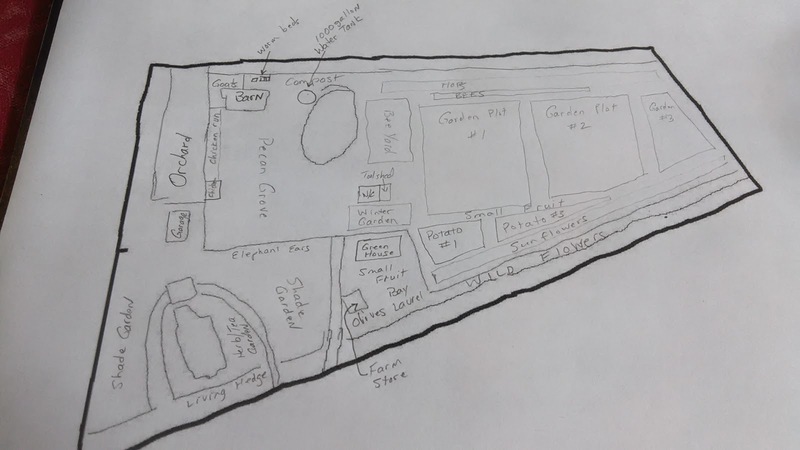 And here's the right side, including the big field and the long-range plan. 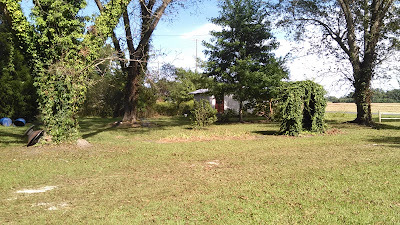 Do you see the tool shed and W/C just above the winter garden? That's where our field water spigot is located. Adam doesn't want to pay for town water to irrigate all those crops (even though there's town water there). 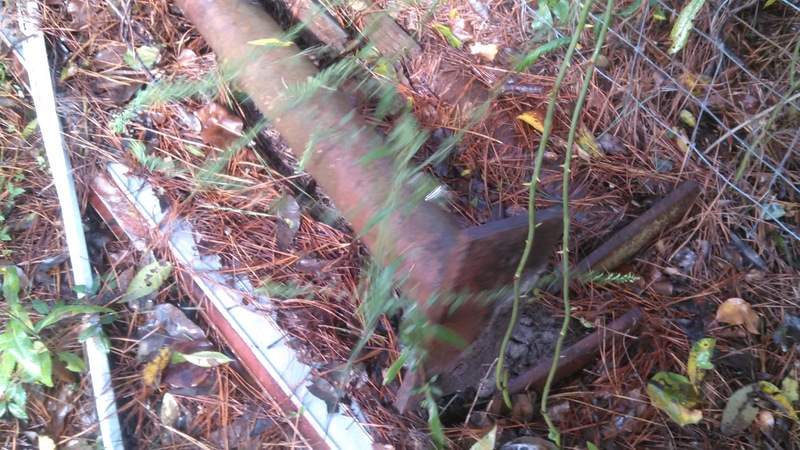 That spigot will just serve a little outdoor shower there, and he hopes to put in a composting toilet. For the crops, he's planning a significant water collection system. See the 1000-gallon water tank? And there will be other large tanks on the back corners of the house and the garage, providing water for the house gardens and the orchard. The front of the property, with wild flowers and tall sunflowers, will welcome customers to our farm store. The living hedge, which will be significant, will give the best possible sound barrier between the house and the road. 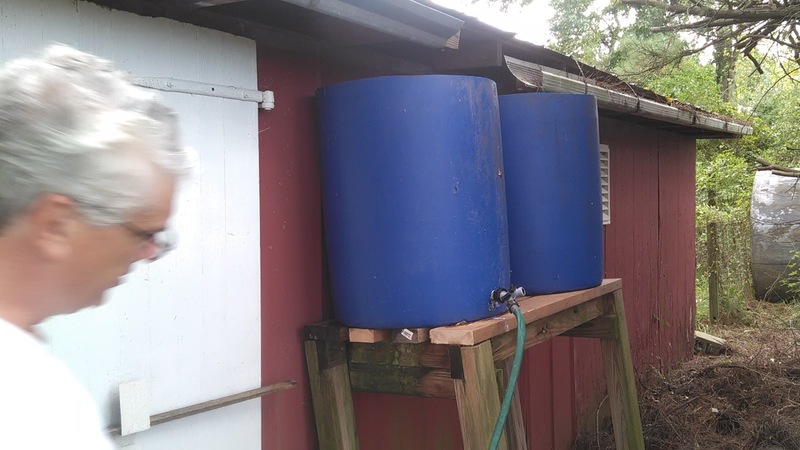 One of Adam's farm projects is making a rain collection system. 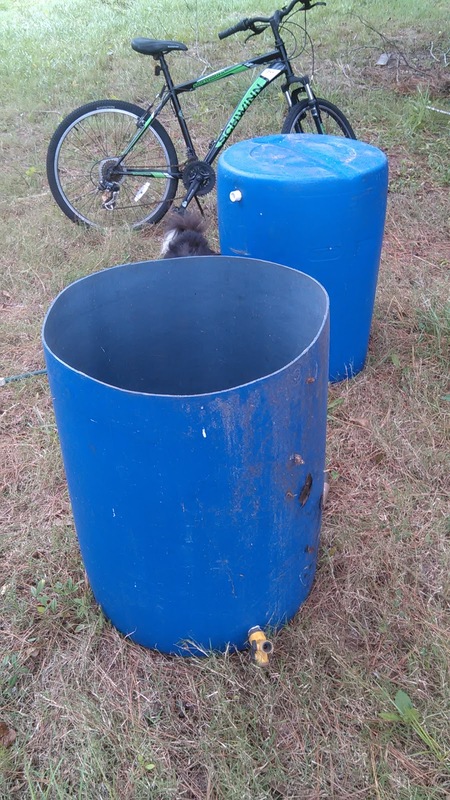 Initially, he's using these two barrels that were left on the farm by Mr. M.
They have spigots attached, and you can join them together into one water flow, attaching a hose. Then you spray water on the compost pile or wherever you need it. These barrels are presently at the barn, collecting water from its roof. 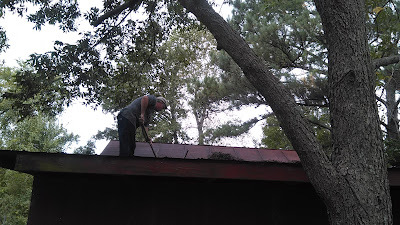 But first Adam needed to clean the roof and gutters of debris like pine straw and leaves. 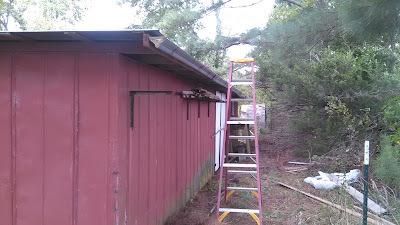 The gutter is along the back side of the barn. And here they are, raised and catching that rain water. 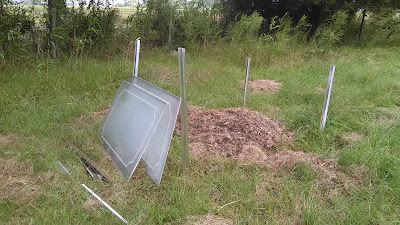 Later this is the shady, protected area where Adam plans to raise worms, red wigglers. 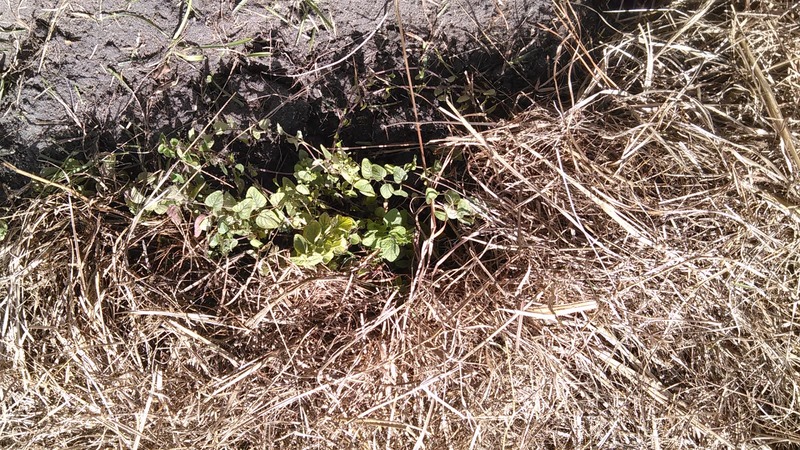 Producing worm casings is actually a thing among natural farmer types. Quite beneficial for one's soil. 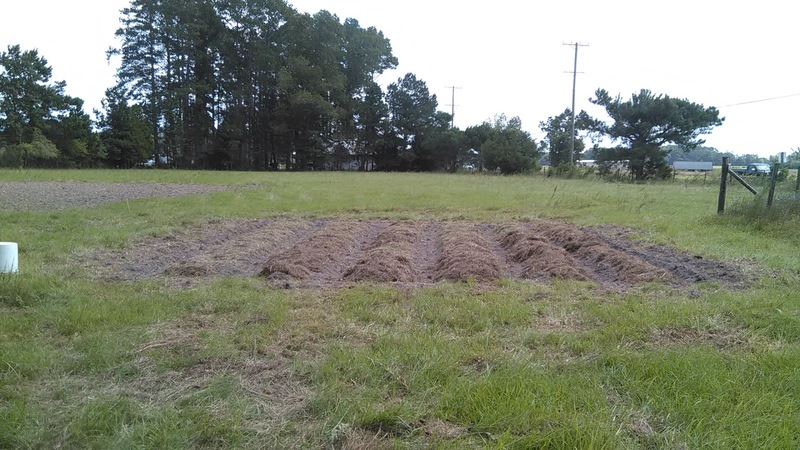 Adam says, "We're growing soil, not crops." Excellent soil will naturally produce wonderful crops. So he's all about the soil. 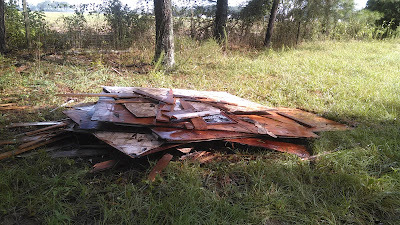 The debris from the roof is already on its way to decay. Almost as soon as we got the seeds into the winter garden, and I took the clothes off the line, and Adam got his two barrels hooked up and ready to go ... the rain began. Here's a photo of Oriental yesterday -- the town where we used to live, right on the Neuse River. 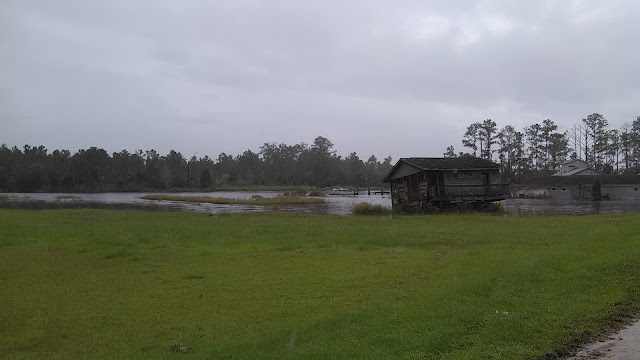 When the wind blows strongly into the river, it piles the water up into the creeks and we get flooding. This is called "wind tide." The area on the right of the fence above is usually Raccoon Creek. 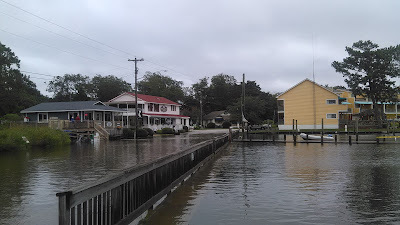 The area on the left of the fence is usually Hodges St. Not yesterday! I guess we should call it Hodges Creek. I'll snap a photo of the barrels soon for you. Meanwhile, a very fortuitous thing has occurred. Adam was chatting with our HUD inspector the other day. He happens to have some land and about eight Friesian horses. Adam read that those large animals put out about 100 pounds of manure each day -- per horse! This fellow piles it up and adds wood chips, but would love for Adam to come haul away as much as we'd like to have. Yippee! 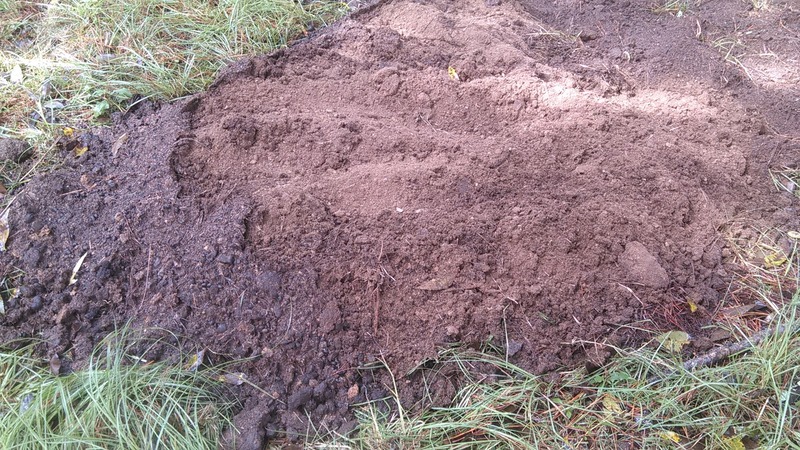 Well-seasoned horse manure is like gold. With the use of a friend's truck, Adam hopes to collect lots of this farm gold. Another nearby friend has cow manure also. 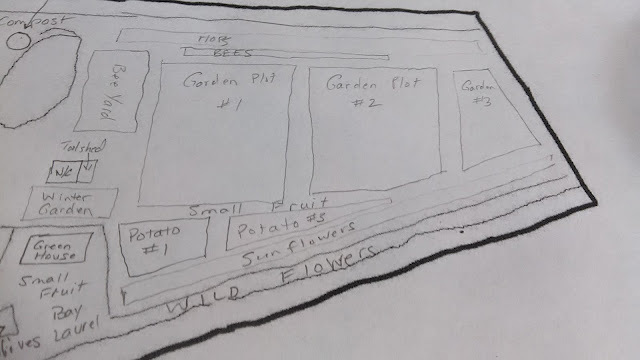 All this wonderful stuff will put us about a year ahead, in our farm plan for growing things. God is so good. Even though our lives in other areas are sometimes quite stressful, quite difficult, we see repeatedly that God is in this farm pursuit; He is blessing it. What a relief and joy that is! Because we truly don't want to pursue anything that He isn't participating in, with us. Adam and I put seeds for winter crops in the garden bed yesterday morning. The weather was coolish and felt like approaching fall. 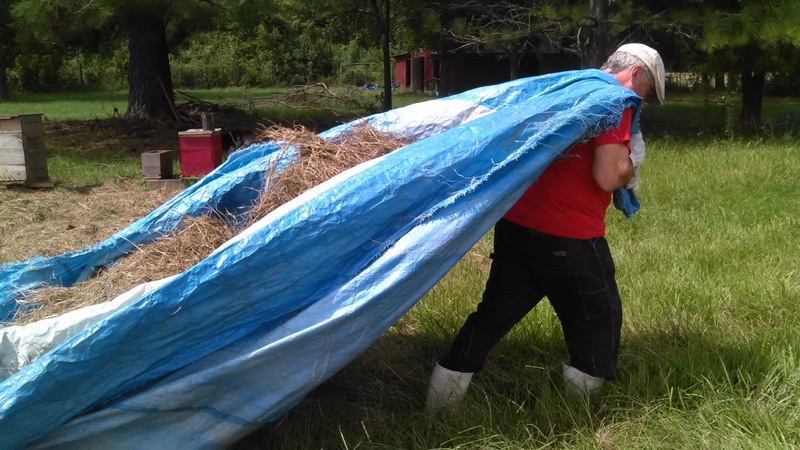 A strong north wind and overcast skies made for a pleasant morning of farm work. The broccoli is in the far right row; the others are various greens, carrots, and a few radishes. 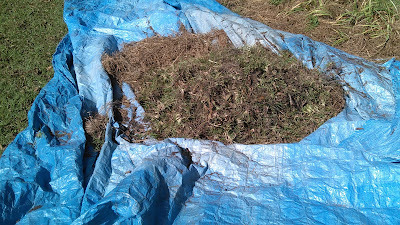 Then we covered it all with dry grass cut from the field before. In late afternoon, the Lord watered it all for us beautifully! 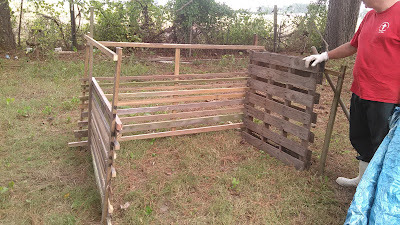 Adam immediately put together this open-sided compost bin using materials that our good Mr. M. left around the farm. He was a collector of all things old, junky, and nearly-useless. Emphasis on the word nearly, because if we can use it, we will! 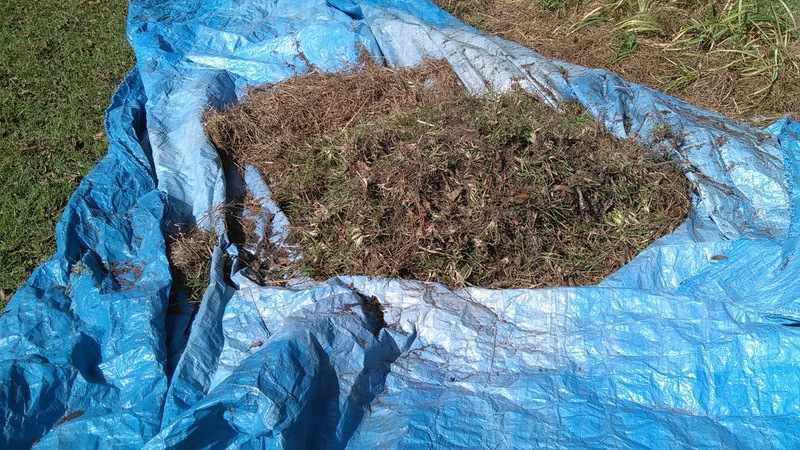 Adam hauled dry grass from the field on the tarp, over to the compost bin. 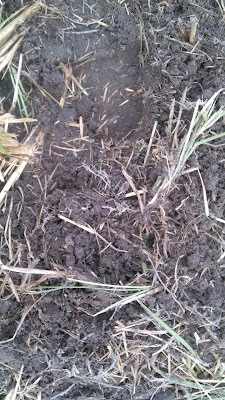 This is the same dry grass we use for mulch on the gardens. 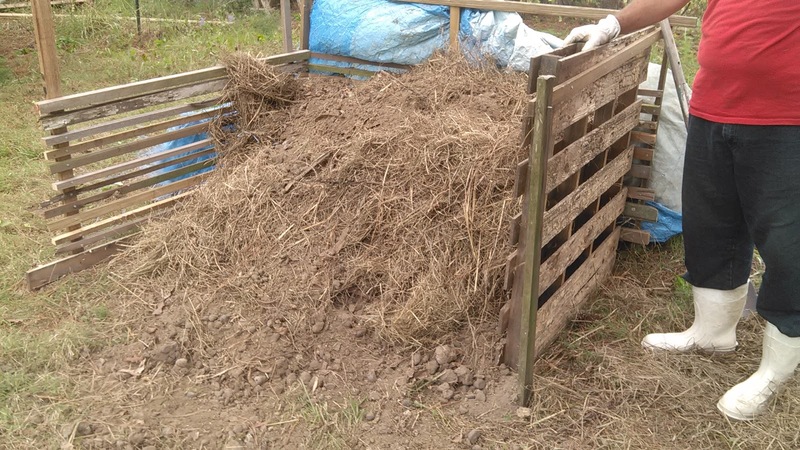 He piled it in, layered with very-dry, very-old horse manure that's been maturing in the barn. As I said before, then God watered it all nicely so it wouldn't blow away. He plans to build a line of these compost bins along the back of the property, which is the north side. The next one will have old shower doors as sides. 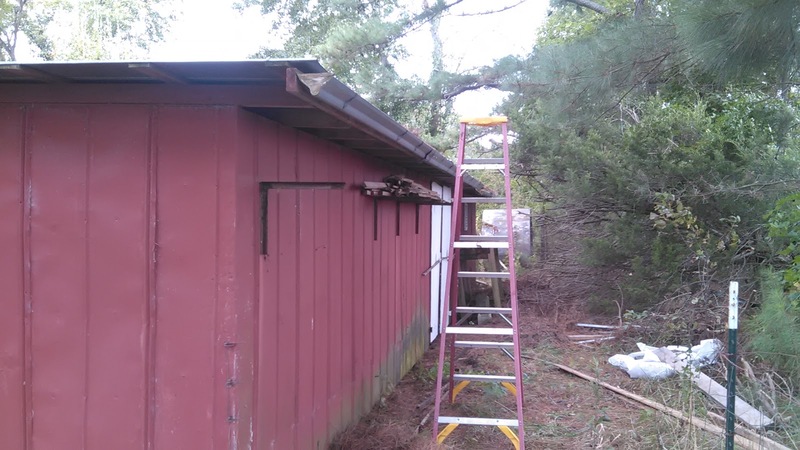 These are the doors we removed from the bathroom, but Mr. M. had yet a second set of doors in the barn, for what reason we do not know. Meanwhile, the peanut gallery was having a blast barking and playing in the patch of blue flowers on the edge of the pine trees. 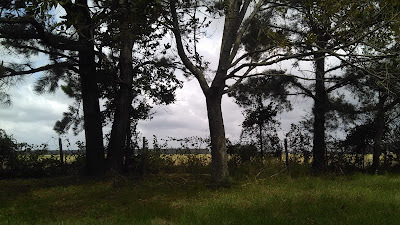 I sat in a chair most of this time, gazing north through these trees across the big corn field. 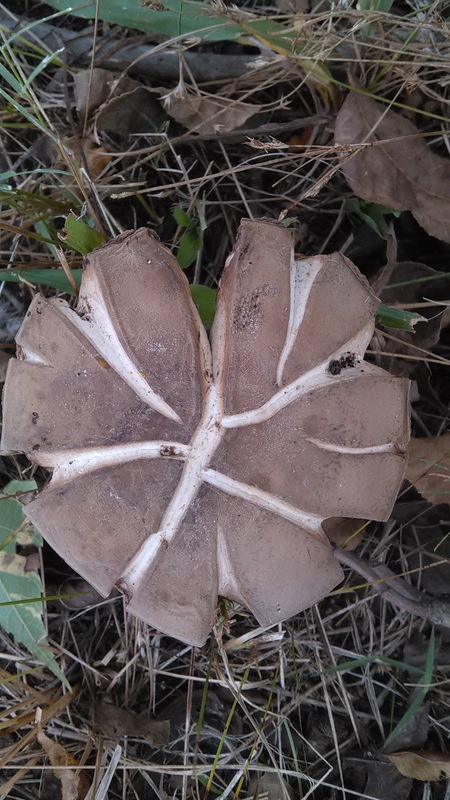 Some are losing their brown, rattling leaves. The wind was quite strong, quite pleasant. I love autumn! We're almost there. 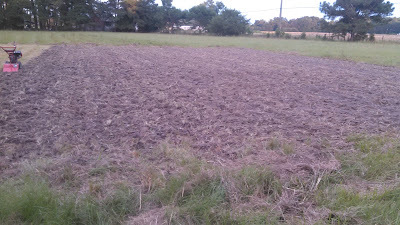 I noticed that our honey bees are flying across this corn field for food. Adam says they are going to a wood on the other side. 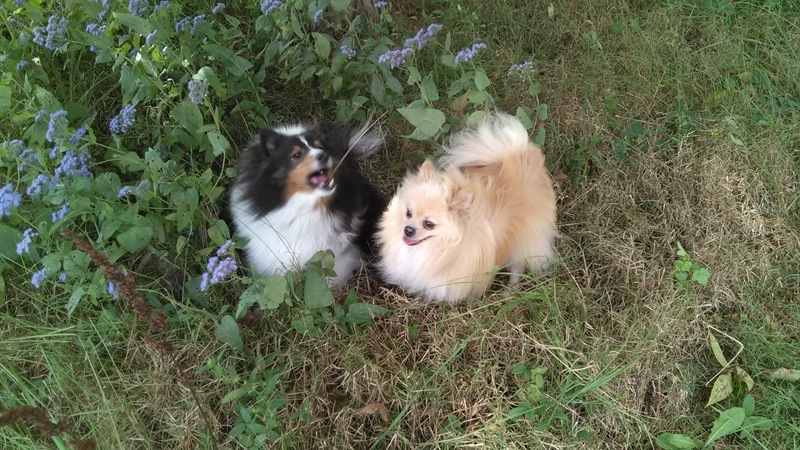 Who knows what's blooming there that they want? In the afternoon while I was at work, the first bag of wheat seed arrived. It's a 25-lb. bag of mixed non-GMO, heirloom seeds. Adam will wait until the temperatures are right to plant it, closer to the first frost. 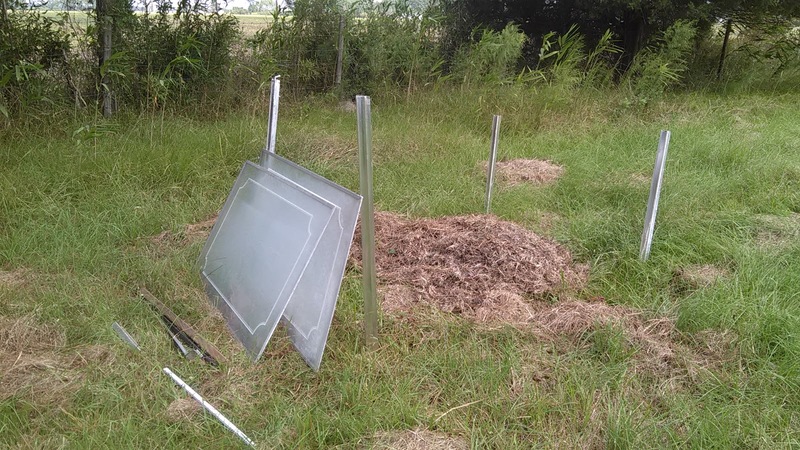 He's researched all the various pests and how to best to avoid their damage. The mushrooms are drying. Isn't that pretty? Adam got busy early this morning on his winter garden, which is about 25 x 25 feet. He mowed it again, and tilled it across, and then the other way. 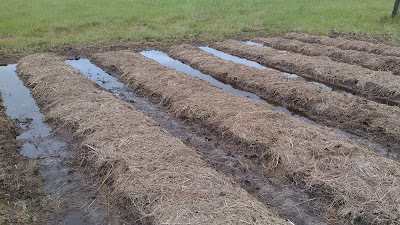 Then he dug out rows too. 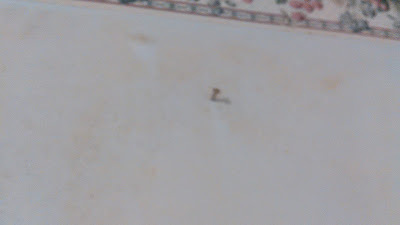 Above you see him in the tilling stage. Later he went to a local farm store and bought lots of seed -- lettuce mix, spinach, arugula, collards, kale, broccoli, and some others. We hope to have lots of greens to sell at the winter farmers' markets when other farmers are out of things to sell. 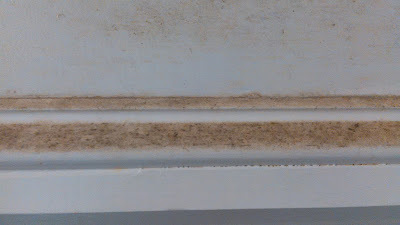 No, that's not some bizarre brown decorative stripe. 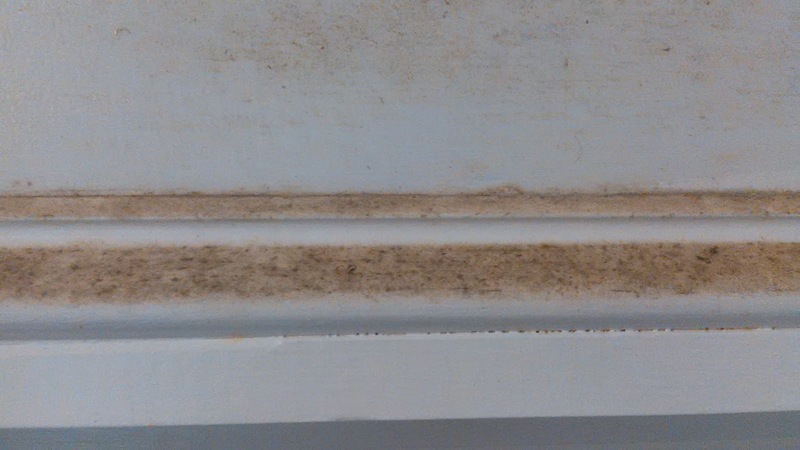 That's greasy dirt way up above the stove. Ugh. The unusual Mr. M. (the previous owner) loved hanging copper molds and pots around the upper regions of his kitchen. The family removed them all, but not the nails, and not these copper brackets in the four corners. The nails were All Over The Place. Some men who live alone have this Nail Philosophy. Use whatever nails you have handy. 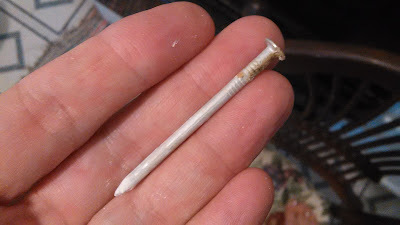 Never move an existing nail if you can simply drive in another one. Bent ones, ugly ones, long ones. Doesn't matter. They were everywhere. See? 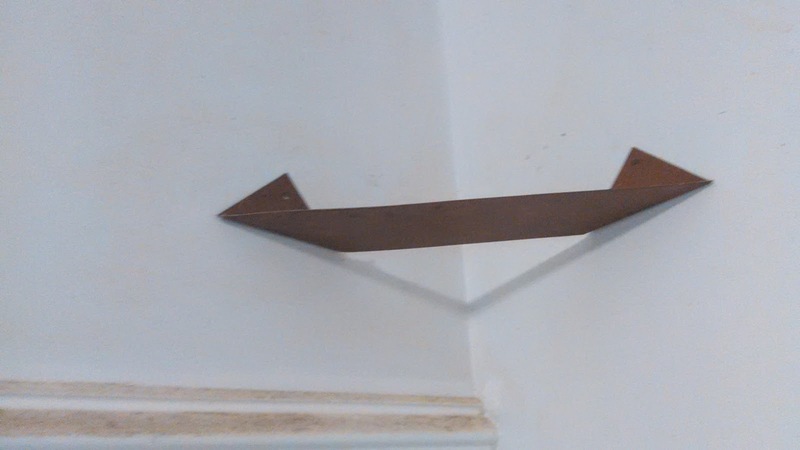 Do you really need a nail this long to hang a little copper mold? Okay, so here's the Grunge Stripe. I scrubbed away at that. 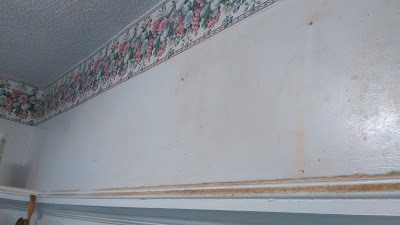 The old dirty grease extended up to the fearsome wallpaper border overhead. Progress. Adam makes huge progress. I scrub dirt. We're getting there! The seeds go in tomorrow! 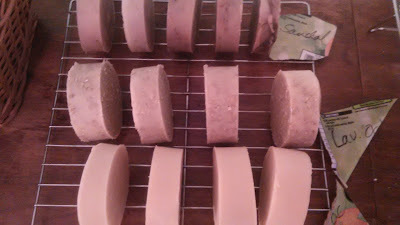 On Monday (Sept. 14) I finally made a new batch of soap, my first batch since moving to the farm. I need quite an assortment of scents. 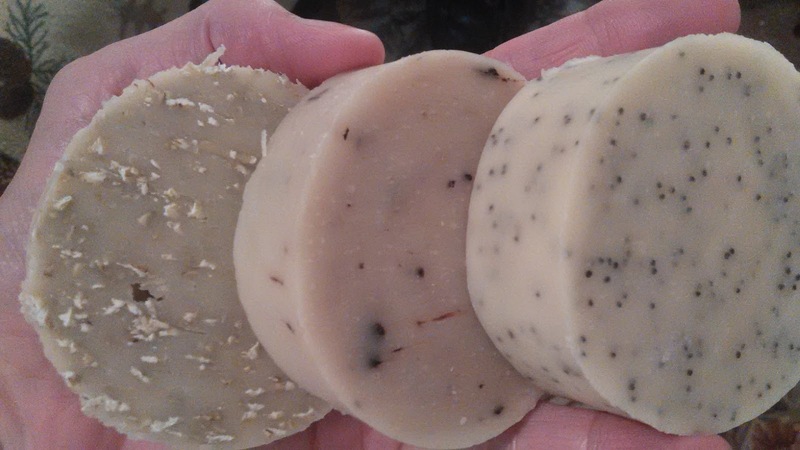 This drying rack has: tea tree, lavender, coconut mango, linen, and lemongrass poppyseed. The coconut mango turned out nicely. It's a popular scent, if rather strong. I use a fragrance oil for that scent. 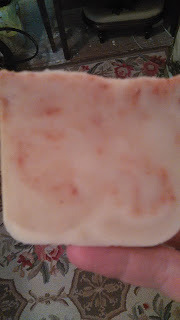 And the swirly pink/red is from paprika mixed into the soap just before pouring it into the mold. My new white rectangular molds that Adam made me leaked this time when I poured the soap straight into them, so I'll probably need to line them in the future with plastic wrap. It's a shame, but they've bowed slightly over the last few uses, and the joints are no longer tight. 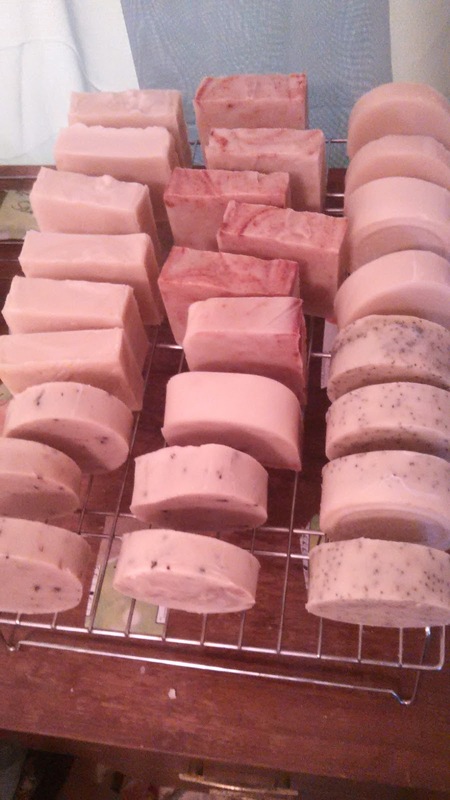 This rack has sandalwood, lavender oatmeal, and lilac soaps. 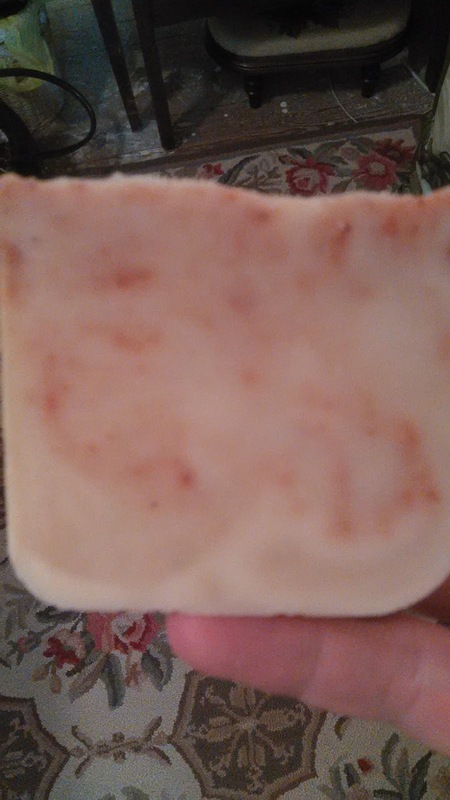 For some reason those other photos turned out a bit pinkish, but in the photo below you can see the true color of the soaps. The lavender oatmeal has only oatmeal (which is a moisturizer) and no colorants. The lavender has a bit of cocoa powder stirred in. The lemongrass has a nice helping of poppyseeds added for exfoliation. These soaps will be cured and ready for sale in mid-October. I need to make another batch or two in the next month so they will be cured in time for the holiday season. When I returned home from the farmers' market after lunch, I brought a big pot of daylilies that a lady had given me. She was dropping them off at the market for anybody, but I said, "Oo Oo! I'll take them!" 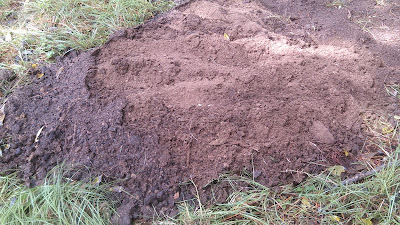 So Adam put the tiller to good use again and dug up a bed. We planted those tall lilies along with some shorter ones a friend gave me in the spring. Then Adam dragged a pile of mulch (dried hay, basically) from the field, and we covered them up. Since we were already dirty, and all the correct tools were at hand, I asked if we could also dig an herb bed and put all my potted herbs in the ground. And we did. Adam is the man-with-the-plan. I don't have to make any decisions about where things go; he's already got it all in his head where everything will be planted in the house-yard. 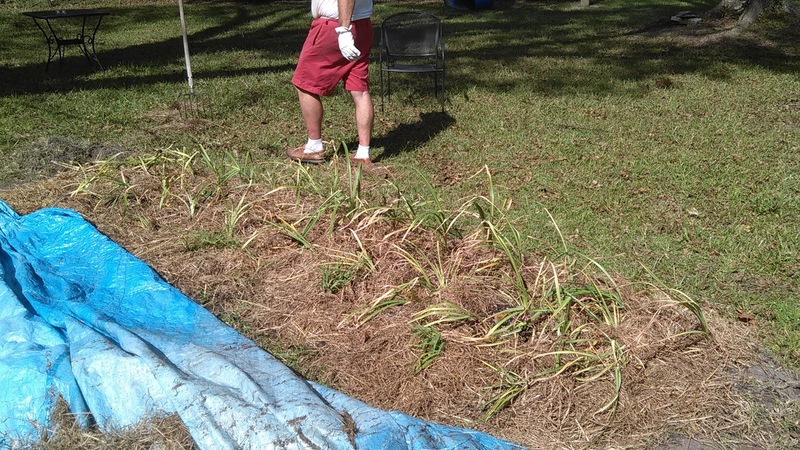 We want to eliminate grass/lawn as much as possible, and turn most of the ground into veggies, herbs, or flowers. Some of these herbs I'd been tending in pots since the spring. But some of them I've had in pots for many years. 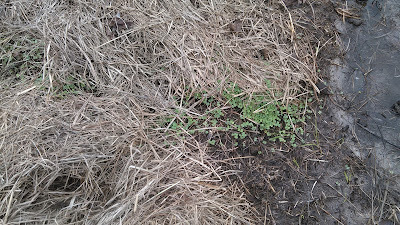 The oregano, I know for a fact, was over-wintered at my parents' house in the NC mountains long ago ... I think after we moved from Prattville, AL, so about 2004. 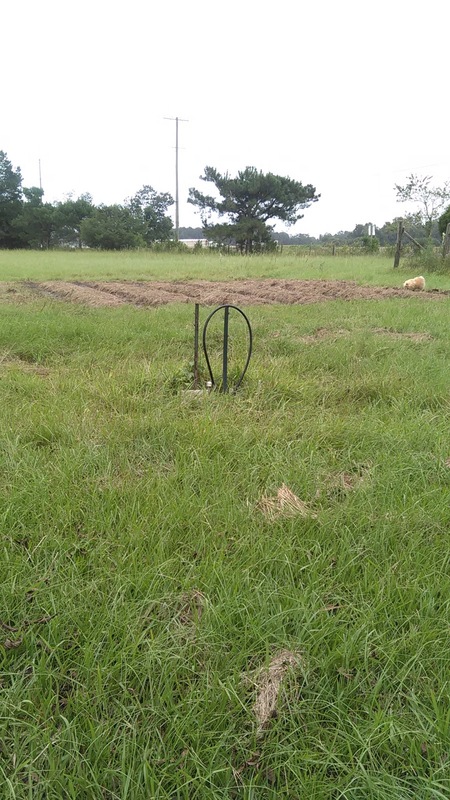 And finally, it goes in the ground. 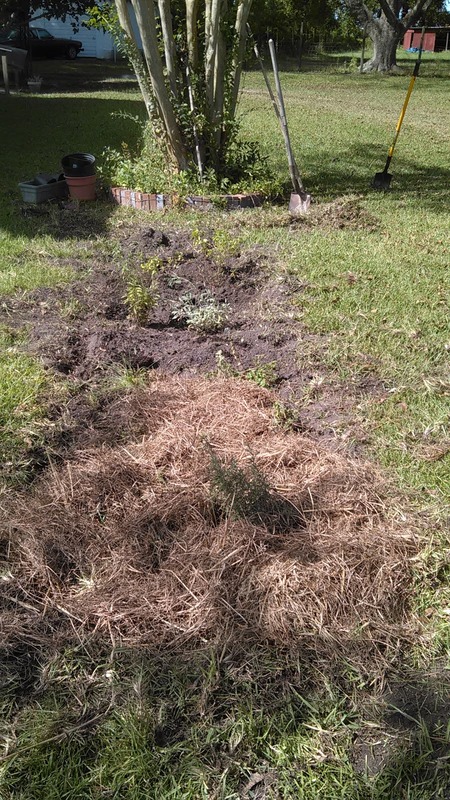 Again, Adam covered all with mulch. I have a rosemarry in the foreground. 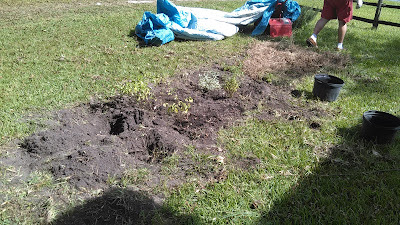 Then 3 oregano clumps, one of chives, one tarragon, one basil, one sage, one rather dead thyme that I hope recovers, and two old mint clumps. At least I'm not starting from scratch (especially this time of year, which would be bizarre), and they are well established. 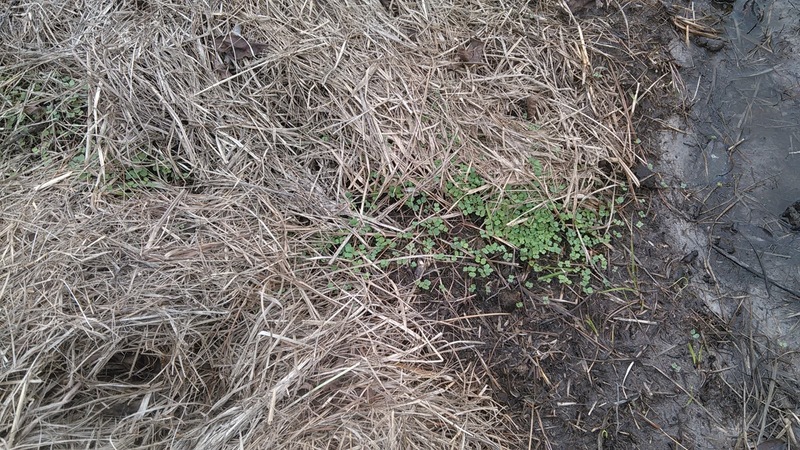 The basil, of course, won't last past the frost. 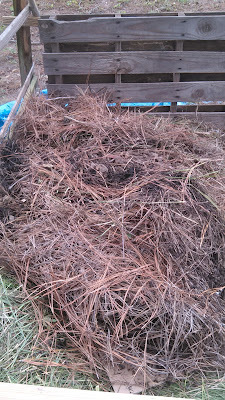 The grass clumps that we dug out of these beds will go back into the field and dry and become mulch for later use. So -- if you stand at the bottom of the ramp from the back deck and look toward the road, the herb bed is there between that crepe myrtle and the fence. It's the sunniest part of our yard. And if you stand at the bottom of the ramp and look over to the out-building, the daylily bed is right there in you path. 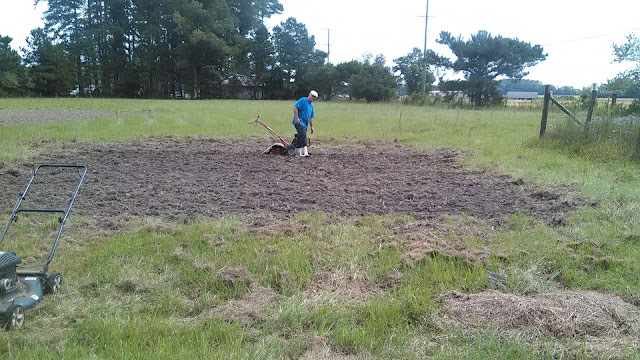 We have a LOT of yard to convert to useful things, but we have now begun! We are quite thankful for the tiller. It made these beds so much easier. (Thursday) -- Advances are happening on the farm. 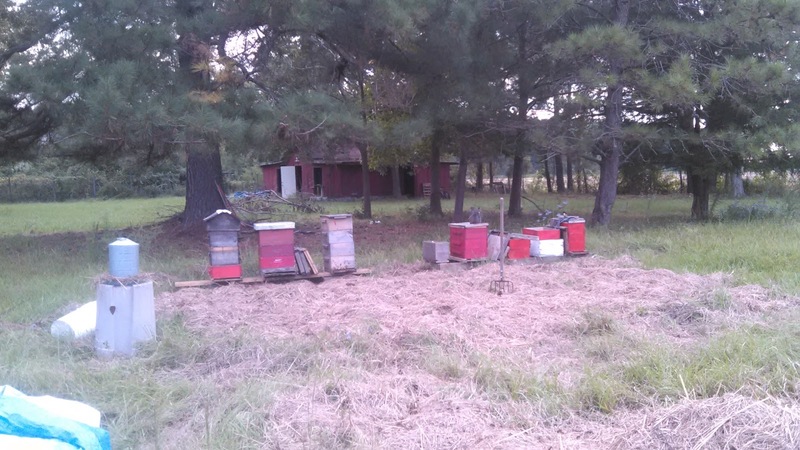 This morning when most of the bees were off working (and therefore out of the hives), Adam put new boxes on three of the hives. He added a top box to the first (Warre) hive on the left, the 3rd hive from the left, and the 4th hive from the left. Then he put out honey water for them to eat. They will be set for the winter, which is a relief. 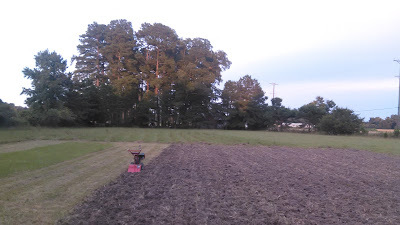 Having bought more gasoline last night, he was able to do a bit more tilling this afternoon. He's about 2/3 finished with the wheat field. 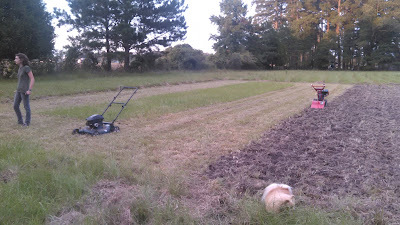 He's got a tiny bit of mowing left, plus some tilling. He realized that the September deadline was for the NC mountains, where we used to live. Here on the coast, he can plant his wheat in October, so he's not as crunched for time as he thought. 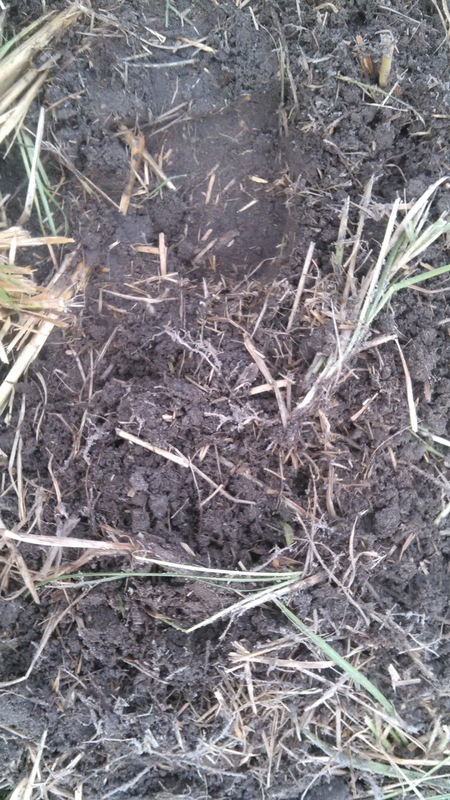 Our soil is nice and dark and healthy. When wet, it is quite mucky, but when dryer it is lovely. 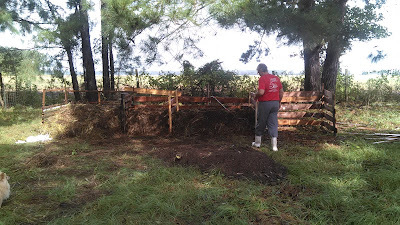 After working in it for several days, Adam says his hands smell like manure; there were animals on this land a little over a year ago. Out past the wheat field (which is about 1/4 acre) is yet more land. 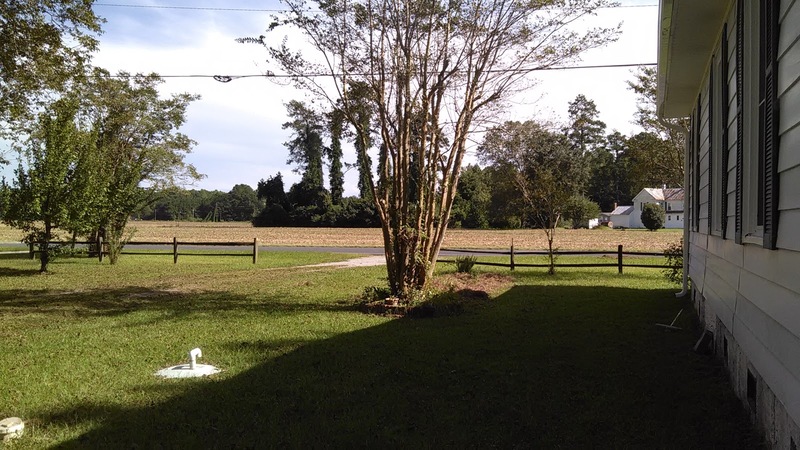 Eventually the present wheat field will become the garden, and the wheat field will move out to that grassy area far away. 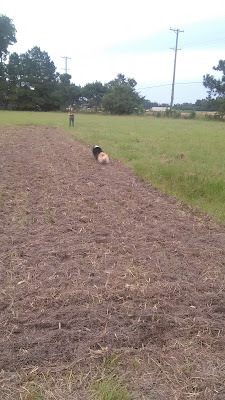 Julia was calling the doggies to come play, and they were high-tailing it out to her! They LOVE having all this play area. Beau plays with the grasshoppers, and he is hysterical. When they jump, he jumps ... straight up in the air. It's a sight to see. 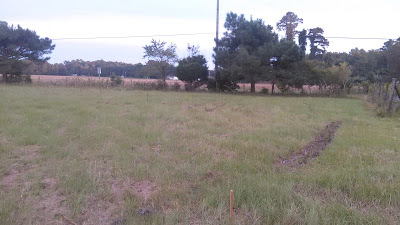 Between the wheat field and the main road is the area that will be the spring garden next year. Forgive me if I'm repeating myself. This is a little stand of pine trees and one cedar. They will stay. I love trees. Can you see the shovel sticking in the ground? That's one end of the winter garden which Adam will work on after the wheat field is done. He's mowed it once. We are so busy here these days. I'm working every afternoon. Julia's off to New Bern for college classes during the week. Anna's waiting tables. Adam is doing his pastoral/preaching/teaching work, his astronomy class, and now his farming. 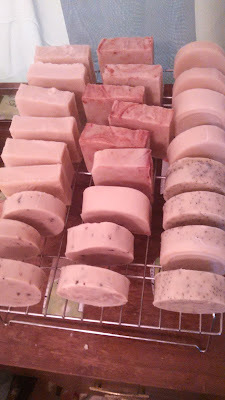 I made a batch of soap on Monday, but I do need more time to knit and crochet for the winter farmers' market coming up. Sometimes Adam and I watch online videos of other homesteaders/farmers who are farther along in this process than we are. It's fun to see what might happen ... what will happen, Lord willing.